A film’s (and its filmmakers’) sense of commitment to its premise and setting is often a tricky thing to fully deal with. On the one hand, the establishment of a milieu and a truly lived-in world is fairly important for the majority of films (certainly all commercial films) in order to draw the viewer into a more organic and visceral experience of the narratives developed. On the other hand, said milieu could very well feel toxic or put-on to a particular, simply by virtue of the events and figures it depicts. Few films in the past few years have displayed this tenuous tendency as strongly as Ready Player One, Steven Spielberg’s adaptation of Ernest Cline’s novel-length paean to video games, ’80s pop culture, and fandoms in general. Set in the year 2045, it depicts two worlds: the “real world” of a decaying Earth, principally the impoverished slums of Columbus, Ohio, and the limitless, virtual reality of the OASIS, filled with innumerable worlds and areas to explore. Wade Watts/Parzival (Tye Sheridan) functions as the viewer’s medium between these realms. As might be implied by his avatar’s name, he is on a quest: following the clues of the virtual world’s deceased creator James Halliday (Mark Rylance), he aims to uncover an easter egg that grants the finder full control of the OASIS. Through this process, he discovers foes – the megacorporation IOI– and friends – most notably Samantha Cook/Art3mis (Olivia Cooke), member of an underground group opposed to IOI – alike. On the face of it, Spielberg might seem like an odd choice for a project as shamelessly obsessed with iconography as Ready Player One, and indeed, much of the film, especially the explanatory voiceover that dominates the first twenty minutes or so, feels far too cluttered. Yet there is something inherently compelling in the mix of utopia and dystopia on display, and the ways in which these are drawn out over the course of the film make it a fascinating, if often frustrating experience. Perhaps the most notable of these is the free movement between 35mm for the real-world scenes, which form a little less than half of the film, and digital for the OASIS scenes. (Note: I saw this on 70mm, which likely helped amplify the difference between these mediums.) This alone is not especially surprising: Spielberg has remained an ardent film devotee, continuing to use with such clarity on such films as The Post. But this acts as another layer with which the film is able to delineate the boundaries between these two worlds, and throughout the film the lines are blurred in a manner that honestly recalled The Wizard of Oz: a digital reflection/projection on VR goggles, Halliday’s memories as viewed by Parzival and his friends through a screen, an insane recreation of The Shining‘s Overlook Hotel filtered through Spielberg’s own sensibilities (perhaps in a nod to A.I. : Artificial Intelligence). It is additionally tempting to view this as Spielberg’s reflection upon the iconography that he himself had a great deal of responsibility in creating. However, the mélange of symbols invoked – ranging from Adventure to Halo to Overwatch – sadly negates much of this hypothesis, though the singular sense of gravity given to Halliday’s sense of regret over the things he failed at in life is startlingly affecting. Better, then, to focus on the sense of play: the grand camera sweeps through a battle scene of thousands, the explorations of the physical and visual sensations of a zero-gravity dance floor. 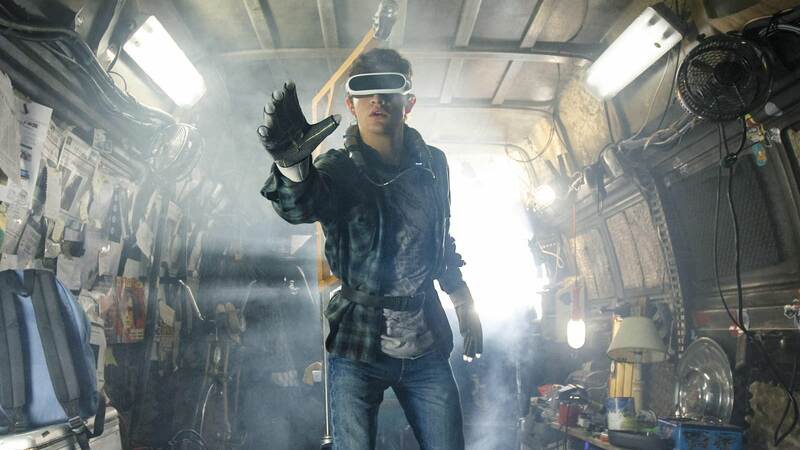 Ready Player One certainly may be a very tough watch for some and an often contradictory experience for most, but it offers more than a handful of unexpected pleasures along the way.